Greeting to all from Indy…the host city for the INTERNATIONAL CHAMPIONSHIP OF BASKETBALL TOURNAMENT next month. I hope to see some of you then. Thank you to one and all for visiting me at National Press Photographers Association national meeting and the Rich Clarkson Sports Photography Workshop. It was great to see everyone. Big news is Canon has finally loosened the EOS-1D channel. If you are on our list we are trying to call everyone, but please feel free to give us a call first. D-60s are still very slow though. Nikon has dropped the price on the D-1H and D-1X and we will have them available. 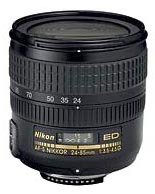 We have also received our first shipment of the new 24-85 AF-S, nice lens!! 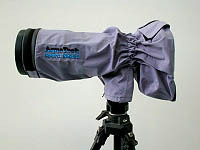 Aqua Tech raincover for a 400mm or 600mm lens. There are only a couple of weeks left on our $99.00 (after $30.00 mail-in rebate) 256/12x Lexar card special. We also still have some of the 1 Gb Lexars at a really crazy price. The Epson 7600 and 9600 printer have proven hotter than I had thought. Again, demand is high but our list is short so jump on. Call me for pricing. As always we have all of your Fuji Pictrographic supplies in stock and ready to ship at great prices. We'll be speaking to you all soon and remember…we are having fun out there.